A meeting between Canada's federal and provincial Immigration ministers ended bitterly Friday, with federal Immigration Minister Ahmed Hussen openly criticizing the Ontario government for what he called a dangerous and un-Canadian approach to the issue of asylum seekers. "They've chosen to use false language with respect to so-called queue-jumping, when we have told them over and over again there is no such thing," Hussen told reporters in Winnipeg at the closing press conference. 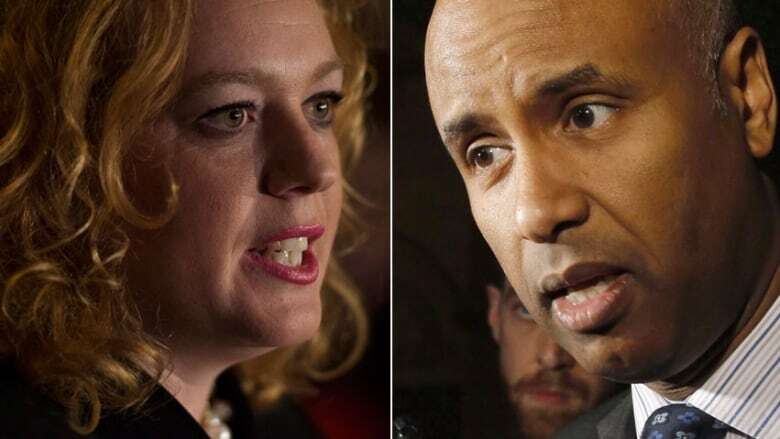 Hussen criticized Ontario's Minister of Children, Community and Social Services Lisa MacLeod — who is also responsible for the immigration file — for walking away from discussions between the other immigration ministers and for refusing to sign the official communique issued after the meetings. "I am not going to get into a debate on semantics with the minister," she said, "but I did request that he take into consideration these exorbitant costs which ... is about $174 million on top of the $3 million that Ontario provided to the Red Cross. "I was expecting that we would be able to collaborate on that. Instead, what I saw here today was ... him calling me un-Canadian, which I take great offence to. And I so hope he will apologize and reconsider his language. "There is a problem at the border, the border must be enforced and ... Ontario should be made whole for all of the costs that we've incurred." The ministers did speak about asylum seekers from the U.S. crossing the border into Canada irregularly, but they also met to discuss economic immigration, francophone immigration, settlement and integration and how to attract new workers to Canada, Hussen said. "So we talked about all those issues, but unfortunately Ontario has chosen to walk away from the table. They have failed their municipalities because they are saying they do not have anything to do with this," he said. "The fact is that temporary housing and housing issues are a shared responsibility and we have to work together, and we are committed to working together. "I've spoken to Mayor (John) Tory of Toronto and I have told him that the government of Canada will have the backs of all municipalities affected by this and we will be there for Ontario." Hussen said the number of irregular border crossers has fallen steadily over the past several months. According to official numbers published Friday, the number of irregular migrants crossing the border to claim asylum has gone from 2,560 in April, to 1,869 in May and 1,263 in June. MacLeod wasn't the only one who didn't sign the communique released after the ministerial meeting. Saskatchewan's Jeremy Harrison, the minister responsible for immigration in that province, also kept his name off it. "It is the Government of Saskatchewan's position that the government of Canada fully fund supports for asylum seekers that have arisen from recent federal policy decisions," Harrison said in a statement. "The Government of Saskatchewan also calls on the Government of Canada to fully fund health, social assistance and employment supports for asylum seekers and recently arrived government-assisted-refugees." MacLeod said her province supports refugees but she is concerned she will not have enough funds to meet housing, health and other demands for asylum seekers without federal help. "I have a large provincial ministry to run that includes children with autism, it includes children in care, it includes women fleeing domestic violence, It includes human trafficking," she said. "It keeps me up at night when I think of the resources that I have to expend elsewhere and I can't help those people as well. I am simply asking them to fix the problems that they have created with their federal policies." Hussen told Canada's premiers that "the government of Canada will have your back" on backstopping the resources needed to deal with the spike in the number of asylum seekers arriving at unofficial border crossing points between Canada and the U.S. He said $50 million has been set aside for that and the money will begin flowing at the end of the month. In the meantime, he said, Canada is obligated to adhere to the law. "On the issue of calling these people illegal," Hussen said, "asylum seekers have a legal right, and Canada has signed international obligations ... we have the Charter of Rights and Freedoms. "Once someone is on Canadian soil and claims asylum, we have an obligation domestically and internationally to grant them a fair hearing." Hussen said the Ontario government's suggestion that irregular border crossers are illegal serves to demonize them in the eyes of other newcomers and Canadians at large. "I can assure you on behalf of Canadians I will fight back against that narrative of fear with facts."